The minister gladly creates wedding services for a couple seeking marriage. We are a welcoming congregation that honors and celebrates love regardless of sexual or gender identity. 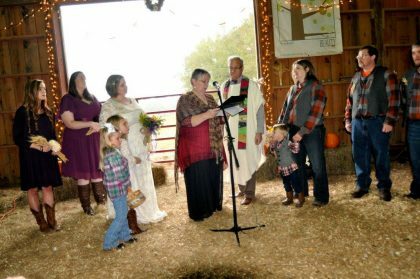 The minister officiates at weddings as a benefit of membership.For non-members, the minister charges a fee of $400, with mileage reimbursement at the IRS rate for weddings beyond 25 miles. Air/train travel and/or hotel costs, if required, will also be covered by the couple. This fee includes all meetings pertaining to the wedding. These meetings include pre-marital counseling, ceremony planning and rehearsal, the service itself, and signing and submission of the marriage license. The average number of meetings prior to the wedding is about four sessions. This may vary depending on the circumstances. Therefore, it is best to contact the minister at a minimum of three months before the desired wedding date.